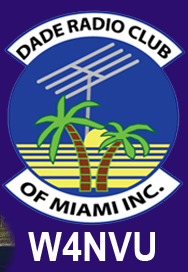 OCTOBER 2014 – W4NVU – Dade Radio Club of Miami Inc.
Meeting was called to order at 19:32 with 37 present. We have a quorum. Julio presided over the meeting and welcomed everyone. The meeting was not broadcast live on the air tonight from the EOC. There was testing being conducted in another room tonight. Everyone took turns and stated their name and call sign. Julio welcomed everyone again and that we have a guest speaker tonight. Merritt will give us a demonstration of a portable repeater. Julio reminded everyone present tonight to sign in. There were no minutes last month. Corresponding Secretary: Lloyd had no mail. Miguel gave ail to Brianna. Treasurer – Brianna advised that she is collecting dues for 2015. Please see Brianna to pay your dues. The dues are $35.00 per person and $5.00 each family member. They must live in the same household. We have received $864 so far in pre-sale tickets and our first check from a vendor. Ham-night-out in 2 weeks, $7.00 to camp; also $10.00 for food for adults and $5.00 for kids. Miguel announced that we moved our account to TD bank because the old bank was charging us fees. Lloyd explained what our dues money is used for – keep the repeaters working; events; hamboree, etc. As a membership incentive, we will give something back like bumper stickers; We will be getting new DRC ID cards and they will be laminated with an ID number. Dues can be paid by PayPal or mail your check. Go to the website. Hamboree tickets are also there. $8.00 in advance and $10.00 at the door. Website – Julio advised that it has been updated. Shopping Cart is up and it works great. It’s easier to use. Club Elmer/PIO – Miguel advised that everything is good. He went to the Melbourne Hamfest. He had a lot of fun. It’s the 2nd largest in the state. Free Flee Nov 15 at UM Engineering parking lot. Makers Fair Nov 8. Nov 29 is Hamfest in the Woods in Okeechobee. Newsletter – We are looking for writers. We are on the 2nd issue. The Reflector is posed on the website. Miguel spoke about the Hambulance. We are making progress. Robert organ Adult Education Center fixed the rust on the doors and roof at no charge. Lloyd went to Cub Scout Pack 280 with David. They took radios and set up a station. They introduced HAM radio to the Cub Scouts. They made a lot of contacts. Even one in California. If you know of any groups or organizations that we can do a presentation to promote HAM radio, see Lloyd. Lloyd announced that this Saturday, Oct 18 at 9 AM will be a SET (Simulated Emergency Test) He gave out the frequencies. We need as many stations to check in. All clubs can participate. Also will be using the “snap shot program”. Check in with your call sign, location and what photo depicts the damage in your area. An email will be going out. If you hear someone on simplex and net control does not hear them, please relay. This is an opportunity to try out your emergency power. Everyone will get a certificate of appreciation that checks in. Lloyd spoke about W5YI. We finally god the approval and certified. Anyone that is a W5YI Lloyd will add you to the list. Just email him a copy of your card. W5YI can issue a call sign right away. Testing that is done at the Hamfest, those that pass will be able to get their call sign right away. Ham Night Out – Miguel spoke about the camping at Castillo Hammocks Park Oct 24, 25 and 26. It will be open after 3:30 PM on Friday to set up. Saturday will be smoking meats. It will be $10.00 per person for dinner; $5.00 for kids for the food. Camping is $7.00 per night per person. Miguel spoke about the Holiday Party. It will be at the Elks Lodge the 2nd Monday in December for our regular meeting. It is at W 72ns Street (Sunset) and 103rd. It will be buffet style Italian. Starts at 7:00 PM; cost is $25.00 per person. There will be dancing and a cash bar. Pay online or at our next meeting..
Hamfest. Lloyd thanked Julio and Ryan for revamping the website. t is going well. He is waiting for the artwork. We have a different building. For tables and booths go to hamboree.og. Tickets are $8.00 in advance and $10.00 at the door. Parking is right there. Food area has been remodeled. Full American and Latin menus; also beer and wine. The 147.000 – Miguel advised that its up and running. Slight audio problem. No elevator access to the tower yet. The 147.760 – Ray is working tonight. Miguel advised its working and the audio is low. The 224.200 – Julio advised that he is waiting for a final on a site. The 444.200 – Miguel advised that it works and being used. The Digipeater – 144.390 – Miguel advised that it is working. D-Star – Miguel advised it is up and running at Jackson Hospital. Looking for an amplifier. Emergency Committee – Miguel announced that there will be no meetings until after the SET. ARES/RACES applications are on the website. There are about 30 approved so far on the list. Net Manager – Brandon advised that less people are checking in on the nets. Testing – Dave advised that we have 8 new techs tonight. He thanked Mike, Ryan, Lenny and Dan for assisting tonight. Merritt did a show and tell on a portable repeater. He built one a few years ago and brought it in to show the club. Dave announced that he still has a site available for a repeater in Aventura. Gene announced the MS Bike ride. DRC is interested. The dates are March 7 and 8, 2015. More info TBA. Virgil asked if there were any new classes coming up. Our instructor is taking care of his wife from her auto accident. To the end of the year the answer would be no. Julio announced that Itech Academy at Edison advised that the club can do testing there. There is going to be a Mass Communication Class and there will be over 520 new HAMS in the future. Dave asked where we stand with Spanish classes. Armando, Lenny, Dave and Lloyd are certified as Spanish instructors. Lenny advised that there have only been tech classes so far. Hollis announced that Lloyd and others were at the Hurricane Center and are in the August CQ magazine. Congratulations! Miguel announced that the next Hamboree meeting will be Oct 30 in Room 135. Brandon made a motion to adjourn, seconded by Lenny. The DRC meeting was adjourned at 20:44.